Sri Lanka thought they had the rub of the green at Hagley Oval, but Tim Southee delivered a mighty Boxing Day counter-punch. Southee smacked 68 with the bat and then backed it up by ripping through the Sri Lankan top order, with his dazzling display catapulting the Black Caps back into a test that started disastrously. At stumps on day one of the second test, Sri Lanka were at 88-4 in response to the Black Caps' 178 – by no means a hopeless position, but since the Black Caps had earlier slumped to 64-6, they would be thrilled with their response. Absolutely nothing went right for the hosts early on. The grin plastered across Sri Lanka captain Dinesh Chandimal's face at the toss was the biggest indication, as he opted to bowl first on a wicket that was greener than the theoretical grass on the other side. Three hours later, the Black Caps were reeling after one of best spells of Suranga Lakmal's career. Lakmal's test bowling average – 39.98 - can be deceiving, with the veteran seamer usually having to toil away on spinning sub-continent tracks. He would have wanted to chop the Hagley pitch up and take it home with him, such was his opening spell, bowling for a remarkable 16 consecutive overs, taking the first four wickets to fall, and leaving the hosts in disarray. Jeet Raval played a poor stroke and got a leading edge, Tom Latham got stuck in the crease and edged a full delivery to second slip, Kane Williamson tickled an edge through to the keeper from a back-of-the-length ball, and Henry Nicholls was cleaned all ends up by a beauty which jagged back in off the seam. Lakmal said he set himself the challenge of taking a five-wicket bag once he saw he'd be bowling in favourable conditions. "That's what we talked about before the game - that like we give the spinners a chance in Sri Lanka, they also have to give us a chance in a place like this. If they can do it at home, we have to do the job away. The fast bowlers have to look to get 10. You can't do it by yourself though. Teammates and coaches have really helped, and I thank them. As soon as I got on to the ground today, I told the coach that I'd be getting five in this game. I was able to do that." 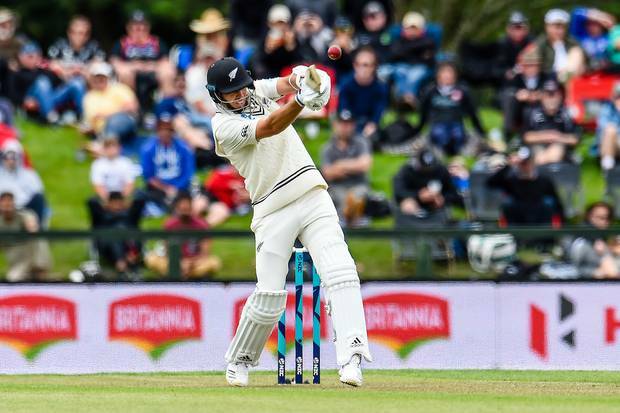 It all culminated in serious trouble for New Zealand, trouble which was only enhanced when Ross Taylor suffered another tremendously unlucky dismissal. Taylor had looked the only comfortable batsman, making his way through to 27, but was run out backing up at the non-strikers end, with the slightest of fingertip touches from Lahiru Kumara leaving Taylor short of his ground. Kumara (3-49) performed well after the early barrage from Lakmal (a career-best 5-54), but in between their respective efforts was the little matter of a 108-run partnership between Southee and BJ Watling. It would perhaps be generous to say Southee strategically decided to counter-attack – it is his natural game after all – but regardless, it worked superbly. There was some luck involved, as there always is, with a few top edges carrying over the rope or falling short of onrushing fielders, but the risk was worth the reward. With Watling (46) perfectly playing his customary recovery role alongside, Southee's fifth test 50 came up off 43 balls, and it took an incredible one-handed screamer from Danushka Gunathilaka to cull the innings short on 68 from 65 deliveries. From there, the Black Caps folded rapidly, from 172-6 to 178 all out, but just as Sri Lanka relaxed and profited from no longer having to deal with Southee, he returned to wreak havoc. Once again, the Sri Lanka top order collapsed, with Southee striking with balls both full and short, in the process moving past Chris Martin for third all-time in test wickets for New Zealand. At 21-3, the daunting combination of Kusal Mendis and Angelo Mathews again linked up following their 108-over unbroken partnership in Wellington, but this time they could only last for seven, as the Black Caps roared back into the test.